I am a Landscape painter working in a semi-abstracted style with an emphasis on geometry, colour and linear values. Light has a strong influence on my work. Living in Scotland where the light and weather are often transient and fleeting, I seek to “capture the moment” in my paintings - whether it is a sky heavy with snow or a sudden flash of light breaking through the clouds to light up the landscape or the surface of the sea. If I had to pick only one artist that I most admire it would be Giorgio Morandi. The deceptive simplicity of his paintings using a limited palette and beautiful sense of light and form are almost hypnotic. Scotland is rich in inspiration for landscape painters. I particularly enjoy the rugged North West coast and the fishing harbours of Fife and East Lothian. 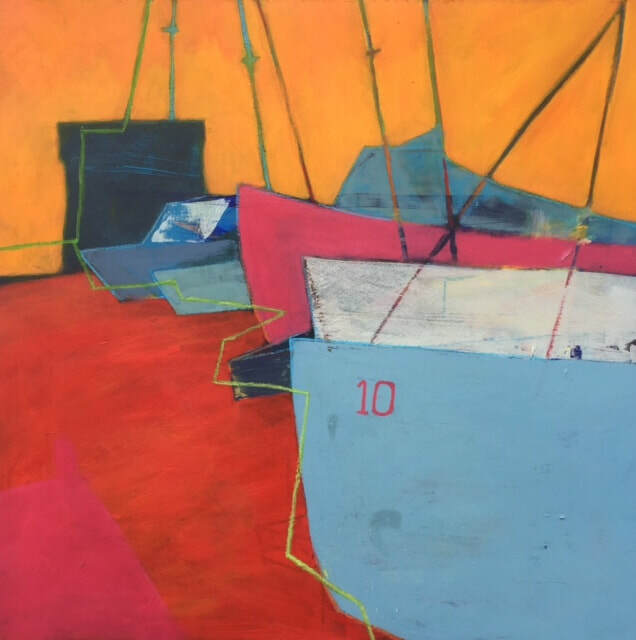 My most recent body of work, “High and Dry”, was inspired by the shapes and lines of boats out of the water, particularly on harbour walls or in boatyards. I have recently spent time at Ullapool rediscovering seascapes and rock formations and look forward to developing this theme next term. This course has been hugely beneficial in developing my practice as a painter. Working with a diverse group of painters who are all self motivated has really focussed my mind in terms of the direction of my work. It is always stimulating being part of a group who all share the same enthusiasm and are mutually supportive. Jemma is an outstanding tutor who is generous with her knowledge and experience and has encouraged us all to find our own individual artistic voices. I am looking forward to continuing to develop my art practice over the next year. ​My paintings are mostly in acrylic with mixed media, building up layers of painted surface. Colour, shape and line are the main focus of my work and I enjoy exploring the negative shapes as well as the objects themselves. Finding a drawn line often mis-registered and superimposed on the painted surface adds a sense of the unexpected and creates a visual tension with the painted surface.